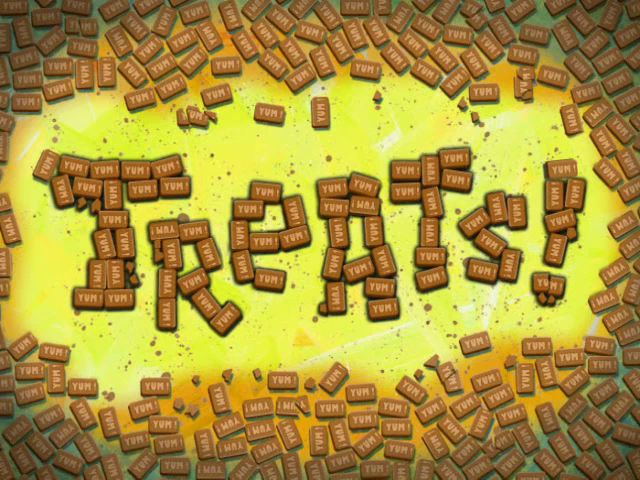 SpongeBuddy Mania - SpongeBob Transcripts - Treats! SpongeBob: Hi Squidward! What ya watchin? News Reporter: We'll be right back. SpongeBob: Oh, it's a commercial. Squidward: (lifts remote) Here, I'll change the channel. SpongeBob: Don't change the channel! Commercial: (a bite is taken out of the Snail Bites logo) Snail Bites. (manly voice) SNAIL BITES! Male Fish In Commercial: (snail licking face) Snail Bites. Male Fish In Commercial: (throws Snail Bite, pet rushes towards it and eats) Snail Bites. Commercial: They're new. They're... (whispers) Snail Bites. Female Fish In Commercial: (gives snail a Snail Bite and kisses the snail) Snail Bites. Commercial: (box explodes) SNAIL BITES! Both fish: Your snail will go nuts for Snail Bites... and so will you. SpongeBob: Did you see that, Squidward? (Squidward is gone) Snail Bites. SpongeBob: Gary, I'm home! (closes door) Oh, Gary! You've got a big surprise coming to you. SpongeBob: Does somebody want another Snail Bite? (shows another treat) Can somebody roll over? (whispers) Roll over. SpongeBob: (gets out of bed) Gary! It is 4:00 in the morning! What exactly do you want from me?! SpongeBob: Gary, this is ridiculous! See? The pet store won't be open for hours. Not to mention it's freezing out here! Can't we just go home and come back in the morning? Harold: Please! I'm just the floor manager! The cashier won't be here for another hour! SpongeBob: Do you have any Snail Bites?! We need some Snail Bites. SpongeBob: I know, you want more Snail Bites. But the pet store was completely sold out of them! SpongeBob: Gary, I just said the pet store was completely sold out of Snail Bites! What am I supposed to do?! Nat Peterson: Well, you can try going to the factory where they make them. SpongeBob: (picks up Gary and leaves) Thanks a lot. Factory Worker: We're closed! Do I have to spell it out for you? C-S-L-O-S-Z-E- Cuh-losed! Not only that, but the very last box of Snail Bites shipped out days ago! They were such a hit they flew out of the stores and now, we've run out of ingredients! From what I hear, the owner even dropped out of the pet food business entirely! Yeah, I mean, why wouldn't he, huh? He's made his money! Factory Worker: I mean, it's not like I wouldn't do the same thing if I were in his shoes! SpongeBob: Would you mind being quiet for one second, please! SpongeBob: Gary, they're completely sold out. There are no more Snail Bites left in the entire world and there never will be! SpongeBob: What do you want me to do, Gary?! Travel the Earth, checking every pet store in existence to see if they happen to have a box of Snail Bites left? Is that what you want?! SpongeBob: Gary, take a look at this map. (opens a map) This is a map of every pet store in the entire world! We've been to every single one of them, Gary! And not one of them has the treats you are after! Not one! I can't keep looking, Gary. I just can't. Patrick: Hey, SpongeBob! Your snail's still meowing?! I have experience with these situations. You're the sponge. He is the snail. You just have to say "no" in a very firm voice! SpongeBob: But I don't want to say no to my little Gare-Bear! I want him to be happy! Patrick: Well, you gotta be firm, SpongeBob! Sometimes, you have to no when to say know. Oh, wait, wait, wait, it's the other way around. You have to know when to say "no". Yeah, that's it! SpongeBob: But I don't know how to say no, Patrick! Patrick: No problem, SpongeBob! You can practice on me! Pretend I'm Gary and tell me "no". SpongeBob: (sweating) I can't! You're so cute! Patrick: (panting) Do it, SpongeBob! (continues panting, Spongebob continues sweating) Do it! Do it! Do it! Do it! Do it! Do it! Do it! Do it! SpongeBob: Gary, this won't be easy, but the time has come when I must say nnnnn.. (Gary holds up a photo to show Spongebob) Oh, Gary, It's a photo, it's a framed photo of the moment I picked you up at the pound. (takes photo and looks at it) I remember that day like it was yesterday. Oh, and a photo of the time you built me a castle made of glitter and lollipops. (sniffles) Gary, this is the most special...Oh. Nice try, Gary.